Trim ends of the zucchini and slice lengthwise. Sprinkle with salt and arrange the slices on a plate positioned at a slight angle so that the zucchini will lose some of its moisture. Let drain for a few hours, then pat dry with a kitchen towel. Heat oil to 350°F (180°C). Fry zucchini slices in batches until golden. Drain on paper towels and sprinkle with salt to taste. Add all but 2 tablespoons of the oil. Add the vinegar, garlic and chili pepper to the pan and fry for 5 minutes. 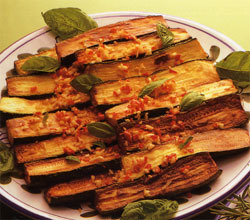 Arrange the zucchini in a single layer in a bowl and pour vinegar mixture over. Scatter the basil on top. Cover and marinate for at least 24 hours before serving.